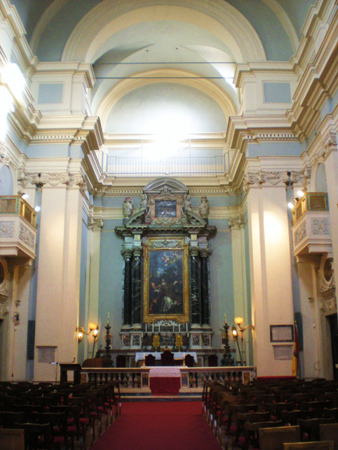 San Lorenzo in Miranda is a 17th century Baroque guild church which is famous as the "church in a temple" in the Roman Forum, but is much less well-known as an edifice in its own right. The postal address is Via in Miranda 10 in the rione Monti, just to the left of the entrance to the Forum off the Via dei Fori Imperiali. Pictures of the church at Wikimedia Commons are here -typically, this has lots of photos of the exterior, and none of the interior. An English Wikipedia page is here. The dedication is to St Lawrence, the 3rd century deacon and martyr of Rome. The official title of the church is San Lorenzo de' Speziali in Miranda. The building was originally the Temple of the Deified Antoninus Pius and Faustina. The temple was erected at the instigation of Antoninus Pius to honor his wife, Faustina the Elder,who was deified after her death in A.D. 140. Upon the death of the emperor in A.D. 161, the temple was rededicated to them both, as witnessed by the inscription on the surviving architrave: Divo Antonio et Divae Faustinae ex S[enatus] C[onsulto]. The structure is a standard Roman temple, seated on a tall podium, approached by a stairway in the middle of which was a brick altar (remains of the latter survive, although the present stairway is modern). The propylaeum was provided with six large monolithic Corinthian columns, 17 metres high, of cipollino marble from Karystos on the Greek island of Euboea. This costly stone, white with pale green or grey veining made up of crystals of mica, is a familiar sight in re-used columns in the city's old churches. There are two further columns on either side, but no others. The propylaeum attaches to the cella, which sheltered to cult statues of the deities. The cella was originally revetted with marble (all of it now plundered), and the surviving marble architrave and frieze of the portico is continued down both long sides. These side strips depict griffins facing each other in pairs and interspersed by vegetal scrolls, and the design was extremely influential in the neo-Classical architectural movement of the 18th century. There are puzzling double grooves carefully cut into the columns near their tops, running round their sides at ascending angles. Many published works, including scholarly ones, assert that these are relics of a demolition attempt in the Dark Ages, whereby ropes would have been slung around the grooves for the workmen to pull the façade down. More recent theories argue that these grooves are either evidence of a temporary canopy put up for ceremonial purposes (little is known as to how Roman pagan temples functioned liturgically), or evidence of structures built in the propylaeum in the Middle Ages (these are known to have existed in the early 16th century). The temple might have been converted to a church as early as the 7th or 8th century, a process easier than for other temples because this one had an unusually large cella. It was believed that this was the place where St Lawrence had been sentenced to death. However, the first documentary reference is only from 1074 when a church here was attested as being attached to a monastery. The meaning of the appellation is uncertain. It was traditionally taken to be the Latin miranda which means "things worthy of admiration" , referring to the wonderful panorama of the Forum from the steps of the building. Another hypothesis argues that Miranda is the name of a benefactress of the monastery. In the late Middle Ages the church was served by a small college of secular priests. In 1429 or 1430, Pope Martin V gave the church to the Collegio degli Speziali (College of Chemists and Herbalists), at the time officially known as the Universitas Aromatorium. They were originally responsible for the processing and sale of medicinal herbs. The present-day Collegio Chimico Farmaceutico is the direct descendent of this guild, and retains St Lawrence as their patron. The next pope, Eugene IV, demolished the rear wall of the cella in order to re-use the materials in repairing the Lateran Palace; this was the altar wall of the church, which was presumably rebuilt using inferior materials. This re-ordering also involved the addition of external chapels to the portico. In 1536, in order to restore the appearance of the ancient temple, the side chapels that had been built in the portico were removed. The work was prompted by the state visit of Emperor Charles V, and was part of a larger project to demolish the medieval neigbourhood that had grown up in the Forum and to replace it with an open space so that the ancient remains could be viewed more easily. After the imperial visit, the area became a cattle market which it remained until the 19th century. In 1601-1602, Orazio Torriani was commissioned to rebuild the church within the remains of the temple. The present Baroque church is the result, which sits on a crypt and hence has its façade rising above the architrave of the temple. A bird's-eye-view of Rome by Maggi-Maupin-Losi published in 1625 shows the church as it was before the rebuilding, revealing that it only occupied the left hand two-thirds of the cella and did not extend as far forward as it does now. There was a campanile tucked into the left hand side of the portico, which seems to have had a cupola with a finial. Archaeological investigations of the temple started in 1801, and the entrance stairway was excavated in 1876. This entailed a substantial lowering of the ground level, to about six metres. As a result the doorway is now stranded above the uncovered floor area of the temple's propylaeum, and hence is inaccessible on that side. From the end of the 19th century to the Second World War there was a sustained campaign on the part of nationalist archeologists to destroy the church and leave only the ancient Roman remains, but the war intervened. In 1956 there was a much-needed restoration. As from 2011, a further restoration of the temple portico has been underway. There have been rumours that this involves creating access to the main entrance of the church, which would enable it and the college to become part of the Forum and Palatine tourist circuit. On the other hand, the college may justifiably be wary of this. As at the start of 2018, the restoration was still undergoing. The columns of the Classical temple have appeared as they are throughout the centuries, along with original dedication to Antoninus and Faustina on the surviving frieze and architrave of the entablature: DIVO ANTONINO ET / DIVA FAUSTINAE EX S(ENATUS) C(ONSULTO) ("To the divine Antoninus and the divine Faustina, by decree of the Senate"). Having the inscription occupying the architrave as well as the frieze is a little undignified for a Classical building. It is not known when the cornice and pediment were lost, but this may have occurred during an earthquake which caused the temple's original roof to fall in. The church façade was rebuilt in 1602, but the ancient columns and entablature were left untouched. It should be remembered that they were polished when new, when the veining in the marble would have spectacular instead of looking like streaks of dirt as it does now. An modern brick staircase has been built from the Forum, but it is impossible to enter the church from that side because of the two-metre gap between the top of the stairs and the door. The only entrance to the church since the 19th century has been from Via in Miranda at the back of the church, where you enter through the College's mostly modern office building. It is still possible to open the church's bronze main door, offering a marvellous view of the Forum, but you need to have a personal contact in the college to have any hope of that. The actual Baroque façade has two storeys, in brick with architectural details in travertine. The first storey has six Ionic pilasters with swagged capitals capped by little winged putto's heads; these pilasters are doubletted so as to give the impression of partly hiding a second set behind. The second pair from the door is tripletted. Unusually, the entablature that they support is also doubled. The entrance, with a plain moulded marble doorcase, has a raised segmental pediment containing a relief of a pair of palm branches emerging from a crown. The second storey has four Composite pilasters, doubletted in the same way as those below. There is a large rectangular window with a triangular pediment supported by two Composite stone semi-columns partly hiding four pilasters in the same style. The playful roofline of the façade features a split and separated semi-circular pediment flanking a finial shaped like a small ziggurat on a cross-shaped plan flanked by horizontal double volutes. One enters the church through a door to the left of the high altar. The church has a single nave with a cream on pale blue colour scheme, an undecorated barrel-vaulted ceiling and three chapels on each side in large arched niches. False arcades were created by giving each niche a pair of Doric imposts from which the archivolts spring, and providing Ionic pilasters, having swagged capitals and winged putto's heads, in between each pair of chapels. These pilasters support an entablature which runs round the interior, except where it is broken by the triumphal arch. The frieze of this is blank, in pale blue, and the cornice is dentillated. There are posts above the pilaster capitals. Four further pilasters are folded into the corners of the nave. The ceiling vault does not spring from the entablature, as might be expected, but from an attic above it. This has blank panels in pale blue, and also runs round the interior except for the triumphal arch. The entrance has a large tablet above it recording the rebuilding, and above this in turn is a portrait of Pope Martin V. A further pair of pilasters flanks the entrance. A photo of the counterfaçade is here. The overall decoration is very restrained, with little stucco and fresco decorative work. The semi-circular molded archivolt of the triumphal arch springs from the attic above the entablature. It has the same curve as the nave vault, being just below it. The ends of the entablature under the archivolt are supported by a pair of doubletted pilasters. The sanctuary is a rectangular bay, with a pair of triangular lunettes in its short barrel vault. A photo is here. The altar aedicule has four Corinthian columns of black marble on plinths with panels in black and white marble. Two of these columns are set back at the far corners, and support the ends of a horizontal entablature. In front, further in, is another pair which support on posts a split segmental pediment into which a tablet of black marble has been inserted. This bears a text referring to the martyrdom of St Lawrence. The cornices of the entablature and pediment are embellished with modillions and rosettes. The altarpiece is The Martyrdom of St Lawrence by Pietro da Cortona, painted between 1636 and 1646 and which shows the saint in a very lacy Baroque alb. (An older altarpiece of the same subject by Marcello Venusti is now in the Palazzo Barberini.) This has a frame in yellow Siena marble surrounded by a strip of green verde antico, and the frame runs round a winged putto's head relief which intrudes into the entablature. A detail of the painting is here. To the left of the altar is a painting of Our Lady with SS Philip and James by the same Vanni who made a mess of the Domenichino in a side chapel (see below). See here. The description is anti-clockwise from the closed main doorway at the bottom of the nave. The first chapel on the right is dedicated to St Francis of Assisi, and the altarpiece shows him venerated the crucified Christ. It is c1670. See here. The second chapel on the right has a Beheading of John the Baptist, in a Flemish style of about 1600, as the altarpiece. See here. To the left is the Flight into Egypt, and to the right is a Presentation in the Temple, both of these being early 18th century. See here. The third chapel on the right hand side has an Annunciation by Alessandro Fortuna as the altarpiece. See here. To the left is Christ with St Catherine of Siena, a picture about which nothing is known (but see here), and to the right is a 19th century Madonna and Child (see here). The third chapel on the left has an Assumption of Our Lady of about 1600 as the altarpiece. See here. In this same chapel on the left is the Birth of Our Lady, on the right is her Presentation and above is her Coronation. See here. The second chapel on the left has a Martyrdom of St Lawrence of the 16th century. See here. 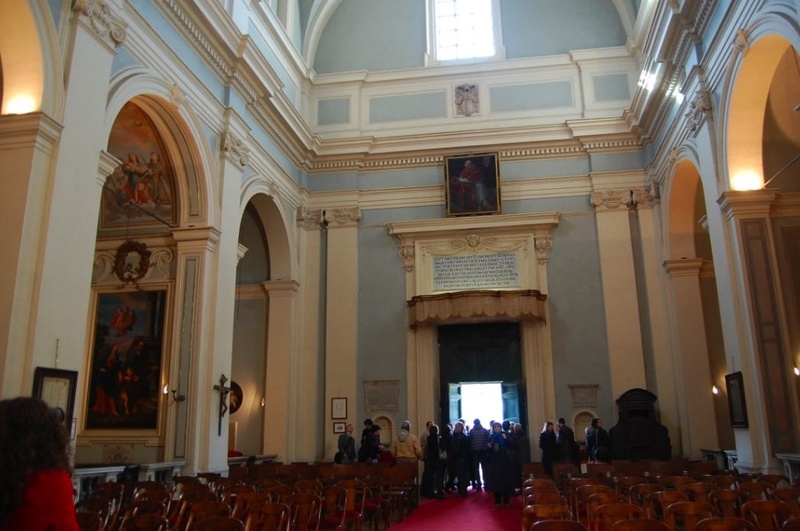 In the first chapel on the left, which is the Cappella Porfiri, there is a painting of the Madonna and Child with SS Philip and James by Domenichino of 1627. It was damaged when Raffaelo Vanni tried to restore it, and a new attempt to restore it in 1985 also failed. See here. The sacristy has a bas-relief of Pope Martin V, and an old tabernacle of gilded wood. The church is normally closed to the public, but in recent years could be visited 10.00-12.00 on most Thursdays. There is a patio off the street through a gate, and the way in is the far door of the office block. Go through this, and continue until you see a door on your left. This is the entrance to the church. The College of Chemists and Pharmacists still uses the old premises of the guild, and artefacts from their history are displayed there. Among these is a book where Rafael has signed a receipt for medicines that he received. A tour of the church often includes this little museum as well. Liturgical events seem not to be advertised publicly. The Thursday opening is apparently no longer advertised, and might have ceased. This would be a serious pity.